Sinn Fein Councillor Deirdre Hargey has taken to twitter to criticise Unionist Voice and accuse our site- which has attracted over 30,000 visitors in the past week- of publicising “untruths”. 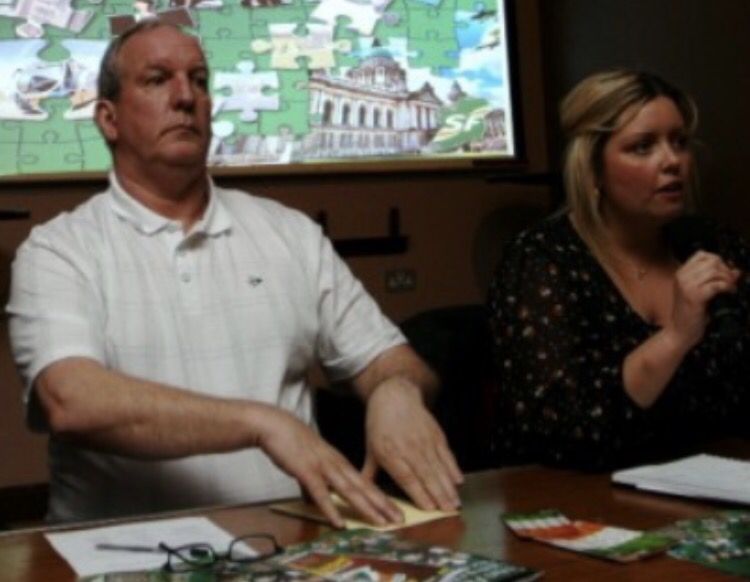 Councillor Hargey is picture below with IRA Army Council member Bobby Storey who was a close friend of the IRA Belfast commander that ordered the murder of Robert McCartney, Gerard “Jock” Davison. 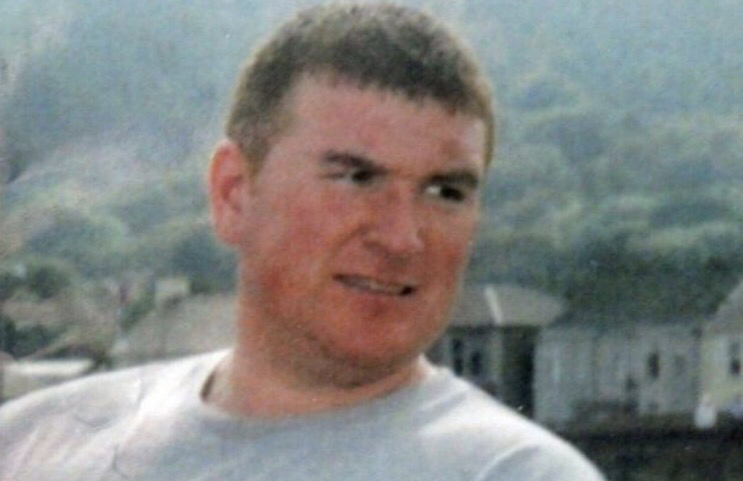 Davison was himself murdered in 2015 and the IRA with the knowledge of Bobby Storey carried out a revenge murder of Kevin McGuigan in the Short Strand area. Unionist Voice has shone a spotlight on the hypocritical nature of Sinn Fein, and their continuing terrorist links, since our site opened last week. We make no apologies for this or for reporting news relevant to the Unionist community. 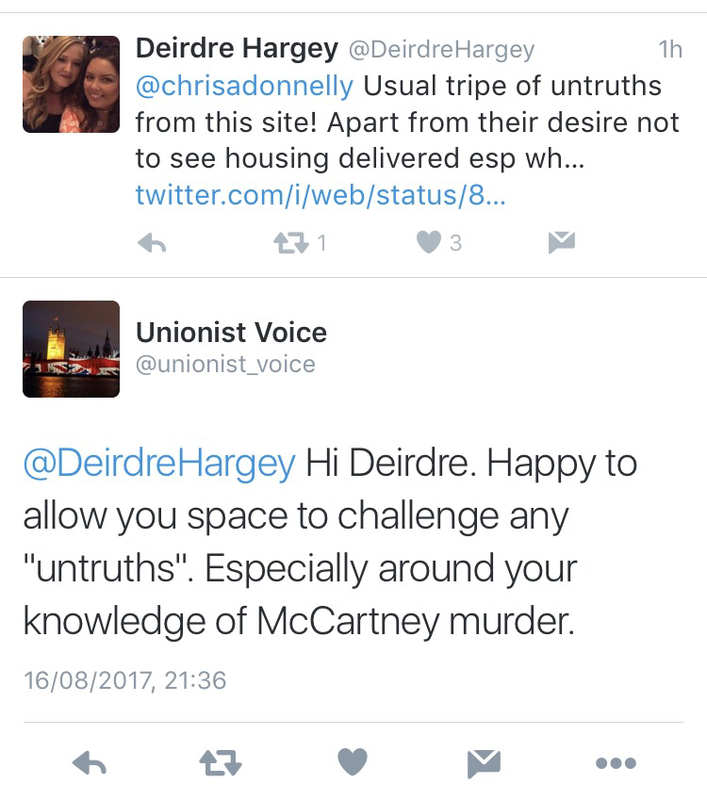 Councillor Hargey was unable to be specific about what “untruths” she was alleging, despite this we have offered Councillor Hargey the opportunity to challenge any information she feels is incorrect and specifically offered her a platform to explain what she knows about the gruesome IRA murder of Belfast man Robert McCartney in 2005. Councillor Hargey has not responded to this offer as yet. 91 Responses to "NEWS: Sinn Fein Cllr accused of withholding murder information slams Unionist Voice "
I’m really impressed with your writing talents as well as with the layout to your blog. Is that this a paid topic or did you customize it your self? Anyway stay up the nice quality writing, it is uncommon to look a great weblog like this one these days.. I will right away clutch your rss feed as I can not in finding your email subscription link or newsletter service. Do you have any? Kindly let me recognise so that I could subscribe. Thanks. you’re really a excellent webmaster. The web site loading velocity is incredible. It seems that you’re doing any distinctive trick. In addition, The contents are masterwork. you have performed a fantastic activity in this topic! Hi there, i read your blog occasionally and i own a similar one and i was just curious if you get a lot of spam responses? If so how do you prevent it, any plugin or anything you can advise? I get so much lately it’s driving me crazy so any support is very much appreciated. Together with every little thing which seems to be developing throughout this specific subject material, many of your opinions happen to be relatively radical. Nevertheless, I beg your pardon, but I do not subscribe to your whole theory, all be it radical none the less. It seems to everybody that your opinions are actually not entirely validated and in reality you are generally yourself not thoroughly confident of the assertion. In any event I did take pleasure in reading through it. Have you ever thought about including a little bit more than just your articles? I mean, what you say is fundamental and everything. However just imagine if you added some great pictures or videos to give your posts more, “pop”! Your content is excellent but with images and video clips, this site could undeniably be one of the greatest in its niche. Terrific blog! We are a bunch of volunteers and opening a new scheme in our community. Your website offered us with useful info to work on. You have performed a formidable task and our whole community will be thankful to you. I am really enjoying the theme/design of your website. Do you ever run into any internet browser compatibility issues? A handful of my blog audience have complained about my blog not working correctly in Explorer but looks great in Opera. Do you have any advice to help fix this issue? Thank you a bunch for sharing this with all people you actually recognize what you are speaking approximately! Bookmarked. Please also talk over with my website =). We may have a hyperlink trade agreement among us! I just added this blog to my feed reader, excellent stuff. Cannot get enough! Your style is very unique in comparison to other folks I have read stuff from.Many thanks for posting when you have the opportunity, Guess I will just book mark this page. Can I simply say what a reduction to seek out someone who actually is aware of what theyre speaking about on the internet. You definitely know learn how to deliver an issue to mild and make it important. More people have to learn this and perceive this aspect of the story. I cant believe youre not more fashionable because you positively have the gift. I’m now not positive the place you’re getting your info, but great topic. I must spend a while finding out much more or figuring out more. Thank you for magnificent information I used to be on the lookout for this info for my mission. Thanks for your marvelous posting! I certainly enjoyed reading it, you could be a great author.I will ensure that I bookmark your blog and will often come back in the future. I want to encourage one to continue your great work, have a nice holiday weekend! I simply desired to thank you very much once more. I’m not certain the things I might have made to happen in the absence of the actual concepts shown by you directly on such theme. It was before an absolute frustrating matter in my circumstances, nevertheless observing a expert technique you handled that made me to weep for joy. I am happy for this service and in addition believe you find out what a great job your are undertaking instructing the mediocre ones through a web site. I am sure you’ve never got to know any of us. Greetings from Colorado! I’m bored at work so I decided to check out your website on my iphone during lunch break. I really like the information you provide here and can’t wait to take a look when I get home. I’m amazed at how quick your blog loaded on my mobile .. I’m not even using WIFI, just 3G .. Anyhow, excellent blog! The very core of your writing while appearing reasonable at first, did not work very well with me personally after some time. Someplace throughout the paragraphs you actually were able to make me a believer but only for a short while. I nevertheless have got a problem with your jumps in logic and one might do nicely to fill in all those breaks. If you actually can accomplish that, I would definitely be impressed. Good post but I was wanting to know if you could write a litte more on this subject? I’d be very thankful if you could elaborate a little bit more. Thank you! Hmm it looks like your blog ate my first comment (it was extremely long) so I guess I’ll just sum it up what I had written and say, I’m thoroughly enjoying your blog. I as well am an aspiring blog writer but I’m still new to everything. Do you have any suggestions for inexperienced blog writers? I’d genuinely appreciate it. Hi, i read your blog from time to time and i own a similar one and i was just curious if you get a lot of spam feedback? If so how do you prevent it, any plugin or anything you can recommend? I get so much lately it’s driving me crazy so any support is very much appreciated. Hiya, I’m really glad I have found this info. Nowadays bloggers publish just about gossips and web and this is actually annoying. A good blog with exciting content, this is what I need. Thank you for keeping this web site, I’ll be visiting it. Do you do newsletters? Can’t find it. I love what you guys are up too. This kind of clever work and exposure! Keep up the amazing works guys I’ve included you guys to our blogroll. Hey very cool blog!! Man .. Excellent .. Wonderful .. I’ll bookmark your blog and take the feeds additionally…I am satisfied to find numerous helpful info right here within the put up, we need develop more techniques in this regard, thank you for sharing. . . . . . I am glad for commenting to make you understand what a magnificent experience our daughter experienced visiting yuor web blog. She figured out several things, with the inclusion of what it’s like to possess an awesome coaching style to let other individuals completely gain knowledge of several multifaceted issues. You actually exceeded people’s expectations. Many thanks for coming up with these warm and friendly, safe, informative and in addition easy tips about this topic to Sandra. Hi there, simply became alert to your weblog through Google, and located that it’s truly informative. I’m going to watch out for brussels. I’ll appreciate when you proceed this in future. Lots of other folks shall be benefited out of your writing. Cheers! The subsequent time I learn a weblog, I hope that it doesnt disappoint me as much as this one. I imply, I do know it was my choice to read, but I actually thought youd have something interesting to say. All I hear is a bunch of whining about something that you can repair when you werent too busy on the lookout for attention.